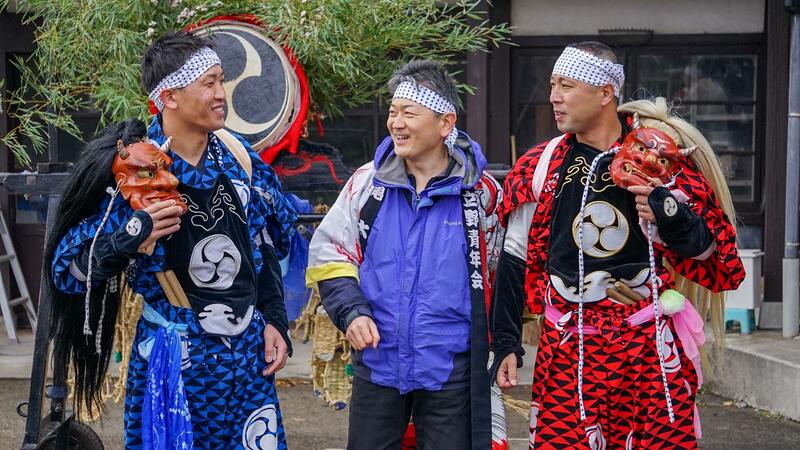 Demon drum dance “Onidaiko” is a traditional performing art found only on Sado Island. Performed at numerous festivals on the island, this dance is a form of prayer for bumper crops and family safety that simultaneously drives evil spirits away from village households. Sado’s Village Festival Experience Tour series was created to give visitors the chance to feel like part of a regional community during its annual festival. We hope you’ll take this unique opportunity to enjoy a lively rural Japanese festival along with the locals! 【Applications Close】 Apr. 6 (Sat), unless full beforehand. *Participants must arrange their own transport to Ryotsu Port and Tateno Community Center (Tateno Kominkan in Japanese) on Sado Island. Tateno Community Center is a 10-min. walk from the nearest bus stop, Sansegawa. *A portion of the tour fee will go to Tateno Village for their cooperation. *Day-trip option also available (5,000 yen/person). Please inquire for details.